SIMPSON BAY, St. Maarten (Dec 16, 2013) WINAIR Flight 104 from Las Americas International Airport in Santo Domingo, was welcomed with the traditional water cannon salute as it touched down at the Princess Juliana International Airport (SXM), Monday afternoon. The welcoming party included Prime Minister Sarah Wescot-Williams, who is also Shareholder’s Representative of the airline. 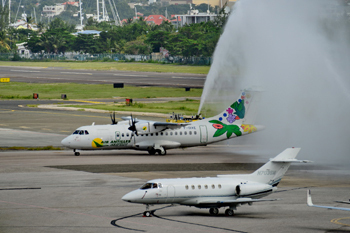 Nothing that the airline brought in 11% of the total passenger movement to the airport in 2011, behind only American Airlines and US Airways, LaBega said the new direct service to Santo Domingo would allow WINAIR to substantially improve on that performance. According to LaBega, WINAIR has operated out of SXM Airport throughout its more than 50 years’ of existence. “The relationship between SXM Airport and WINAIR is by no means a shotgun marriage; it is a relationship that has stood the test of time, and will continue to do so,” she said. WINAIR’s CEO, Michael Cleaver, thanked his Supervisory Board and Shareholders for their support of the airline’s recent expansion, which began December 15, with new destinations Curacao, Tortola, and Anguilla in addition to Santo Domingo. Cleaver also thanked the management and staff of WINAIR for their tireless efforts and the passengers for choosing the airline. “We at WINAIR will continue to work diligently to provide outstanding service to our customers wherever your travel needs may take you,” Cleaver said. The ceremony concluded with LaBega, joined by Chairman of SXM Airport’s Supervisory Board, Clarence Derby, presenting a plaque to WINAIR and tokens of appreciation to the Captain and crew of the inaugural flight, followed by a ribbon cutting. WINAIR operates an ATR 42 aircraft on this flight with a capacity of 48 passengers. The new non-stop service to Santo Domingo will be available weekly on Monday, Thursday and Saturday.